Dr. Meserkhani is a prosthodontist, a recognized dental specialist with three additional years of post-graduate education beyond his general dentist degree. He is a master of tooth replacement and tooth restoration. 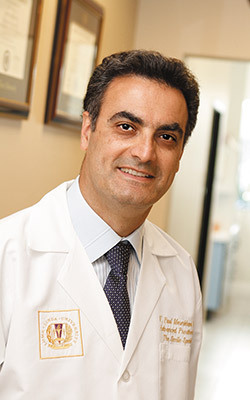 Dr. Meserhani is a world-renowned expert in the field of smile restoration and lectures both nationally and internationally on restorative techniques. He has published numerous articles in peer-reviewed journals and is frequently sought out by other dentists in assistance with the treatment of complex cases. In addition to his prosthodontist training, Dr. Meserkhani is also highly educated implantologist, making him uniquely qualified to provide the latest solutions in restorative dentistry—implant-supported replacement teeth. He has been awarded Diplomate status by the American Board of Oral Implantology, a prestigious designation only achieved by 400 dentists so far. Prosthodontists receive advanced training above that of general dentists in the cosmetic and functional aspects of providing tooth restorations such as crowns, bridges, veneers and dentures. They receive advanced education in proper bite alignment and the functioning of the jaw joint (TMJ), and they are trained to address any issues related to this. They can also address issues related to sleep apnea (the frequent cessation of breathing during sleep due to obstruction of the airways) with special oral appliances that help to keep the airways open at night. Prosthodontists are qualified to handle even the most complex dental cases. When the work involved requires several procedures and specialties, the prosthodontist acts as the leader of a team of dental specialists to provide the necessary treatment. At LA Dentists Group, Dr. Meserkhani has put together a team of top-notch specialists to provide state-of-the-art treatment to restore any smile to full health and optimum aesthetics. No matter your dental needs, you can receive full treatment under one roof, personally supervised by Dr. Meserkhani for the best possible outcome. Do You Have Missing or Broken-Down Teeth? Our dental specialists use advanced, state-of-the-art technology to provide precise, gentle and minimally invasive treatment. Our doctors are friendly and will keep you comfortable at all times. Even if you need advanced treatment we can restore your mouth to full health, function, and beauty and give you a smile that you will be happy to show.